I’ve been counting days he has been bedridden and/or housebound. I’ve been counting the months since my last in-home nursing respite. Before I put these numbers down on this page, I would like the reader to first imagine their child being the one restricted to the bed; their other children being the ones not able to get out for any activities other than school; them working 24/7 at a tiring task keeping their child alive every single day. Close your eyes. Mentally step into these shoes, if you can. Brendan Bjorn has been bedridden and/or housebound for approximately 403 days since February 2017 when his first pressure sore developed. In 2017 he was bedridden for 122 days. In 2018 he was bedridden for 191 days. And so far this year, he has been bedridden and/or housebound every day, 90 days and counting. The last time I had in-home nursing respite was June 2017. 15 nights break out of 365 days working 24/7. Were it not for the wonderful LauraLynn Children’s Hospice charity providing 15 nights of respite per year, I would have had absolutely no break. Drop off time is 2pm, pick up time is 12 noon. That’s 22 hours break 15 times per year. 330 hours break out of the 8,760 hours per year. Family Carers Ireland did a study that showed family carers such as myself save the Irish Government approximately €10 billion per year. That’s a lot of money. I have to then ask, where is the support for family carers? Why is there not more in-home nursing respite available…and without the recently concocted Loco Parentis restriction? Why are there not more medically suitable overnight respite facilities like LauraLynn? 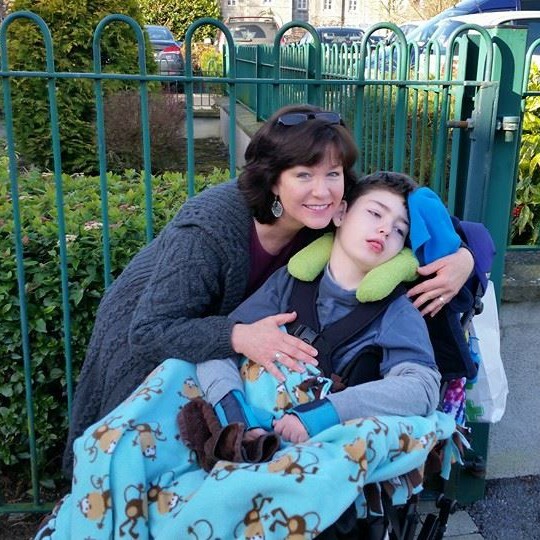 Why does the State not see that family carers such as myself could contribute far more to our communities if we could simply get out of the home? And why does the government not understand that many carers are themselves sacrificing and often ruining their own health by caring 24/7 with no breaks, no support, which in turn will only cost the state more money down the road? I’d like to think I can count on the government to listen to my questions and to work toward these desperately needed reforms to support family carers. Because you know what? It isn’t just about me and all the other carers. It ultimately is about the care we are able to give to our disabled children or other family members. If we are exhausted physically, emotionally, and mentally, we aren’t able to give the best care possible. Can you imagine a nurse being required to work under these conditions and these hours? No, and it would not be allowed to happen. Yes, it’s Mother’s Day weekend. I’ve done my counting. In my head I will count the hours and days, dreaming of either bedtime or of some future break. In my heart I will count my blessings, the 2 most precious being my two beautiful sons. There is a waitlist. Not enough OTs or specialised seat technicians for the amount of kids waiting for such services. It’s so wrong.